We’re definitely a Kindle family and I haven’t been shy about sharing my love of our family Kindles. My last Kindle-related post was last month about stealing my kids’ Paperwhite. I can feel a little less guilty about it now that we also have a Kindle Fire for the kids. We got the Kindle Fire thanks to Staples and it’s great that they now each have an e-reader. I have been a huge proponent of the idea of an e-reader for kids, especially ones who are reluctant readers. In previous Kindle posts, I have discussed how my oldest isn’t a huge fan of reading and how he does so much better on a Kindle. He can make the font bigger; not seeing the length of the book makes the idea of reading something long less daunting. I can’t tell you all how HUGE this was at a time when he really wasn’t wanting to read. I truly attribute our older Kindle to being the thing that got him over the hump of hating to read. Even today, while he’ll read a real book, he still choose to read on the Kindle. The thing too specifically about the Kindle Fire that differs from the Paperwhite is that the Fire is also a tablet offering apps and a multitude of other options. If you are looking for an e-reader and a tablet for your child, this is definitely one of the best options out there in terms of bang for your buck. Another feature worth mentioning – Kindle FreeTime. This works specifically with the Kindle Fire only. For a $2.99 a month subscription fee if you have Amazon Prime ($4.99/month if you do not), you can get hand-picked books and apps delivered to your child that are age-specific and screened as appropriate for your child. This is the future, people. At last week’s back to school night, we talked with the teachers about smart boards and iPads. Kids will be on tablets and computers moving forward and I want my kids to get the most out of their education and the most out of technology. 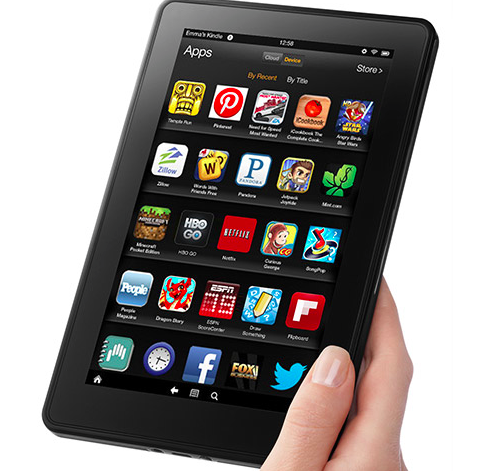 A tablet like the Kindle Fire is a great option for young kids and definitely offers a world of options for your kids! Disclaimer: I received a sample Kindle Fire from Staples to facilitate this review. As always, all thoughts and opinions are my own.